Digging hundreds of metres below the surface searching for precious ores and orbs can be a lonely pastime. With no one but the odd enemy anywhere near you the potential outcome feels bleak. 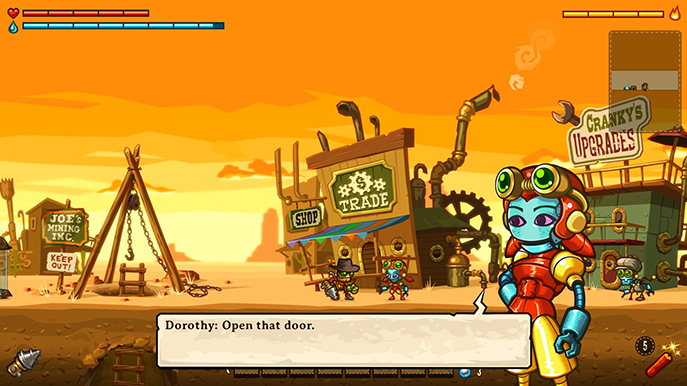 However, SteamWorld Dig knows this and constantly rewards you with frequent upgrades to you and your equipment making every time you re-enter the mine feel that little bit more satisfying as you become a powerhouse in the industry. Rusty lives in a world populated by robots and has travelled to a run-down town upon the news of the death (or power-down?) of his uncle, the owner of the mine. The town has seen better days and there is no one left to work the mine. Your uncle's final wishes are for you to take over, restoring the town to it's past glory and so begins the game. Time to start digging. You have a relatively narrow area in which to mine but the depth is huge. You are free to dig in whichever way you please but the best method is to search for ores. These are clearly marked in the squares of dirt where they reside. These are key for progression. Each has a set amount you can sell it for and you can carry up to four of each type with three slots (at the start). Once your backpack is full you need to travel back to the surface to sell them. And repeat. The controls are fluent throughout though wall jumping took some getting used to. I'm not quite sure exactly what it was, but I think you have to slide down a tiny amount before jumping again. It made climbing the several hundred metres to the surface a little tedious in the first half hour. Thankfully other options become available not too long after starting. 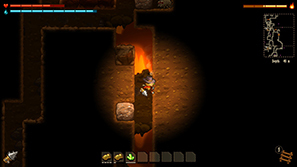 As well as purchasable upgrades there are doors deep underground that lead to puzzle rooms. These are well designed, not particularly challenging but a nice change of pace from digging. Some of these rooms are there for the story and you get these strange mechanical upgrades which give you a new power, the first being a steam jump. All of the powers you collect are helpful and you'll use them frequently. 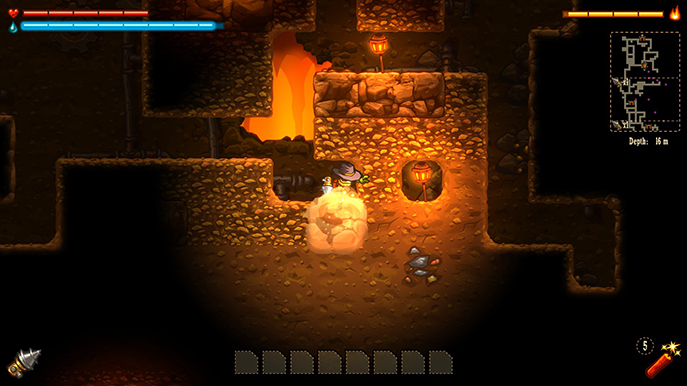 There are several bars to keep an eye on while you're in the mines. There's health, water and lighting. Health is self explanatory, water is required for your steam powers, and lighting constantly drains reducing how much you can see. You can replenish these by defeating enemies or finding pools of water. Health and water can be tricky at first but I only ever ran out of light once, near the end (purely because I wasn't paying attention), so it's not much to worry about. The deeper you go the more the ores are worth and this begins the fast paced upgrading system. You'll soon find yourself making $1000 per trip to the mine and you can upgrade everything in the shops in the town. More health, water, light, mining equipment upgrades and others. You can also buy teleporters (very useful! ), ladders and lamps, though I didn't use the latter once. I found there was a bit of a spike in difficulty once finding the second area, feeling underpowered for my surroundings, but once I upgraded a few things I was fine. In fact, you get to a point where you're so overpowered with upgrades mining is just a formality that you can breeze through, practically invincible, though this happens about thirty minutes from the end. It took me three hours and one minute exactly to complete the game. While some may think this is short it felt appropriate for the game. If they made it longer upgrades would suffer, costing more and making you spend more time mining purely for the ores. The fast paced nature is what keeps the game enjoyable and satisfying. 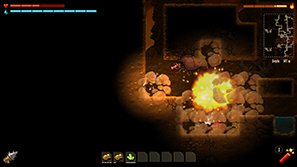 When upgraded you can travel back to earlier areas and have joy blasting swiftly through blocks that used to take several hits with your pickaxe and completing previously impossible puzzles with your new tech. 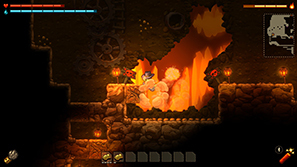 SteamWorld Dig is a great take on mining gameplay that has been popularised by the likes of Minecraft, Terraria and Starbound. By including a light story on top of the gameplay and the constant upgrades making you feel increasingly powerful this is a great way to spend a few hours one evening.